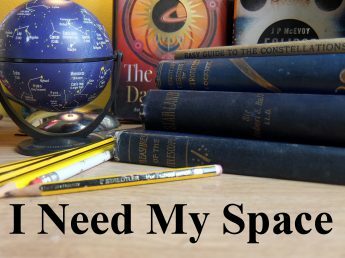 August | 2017 | I Need my Space! It was a clear night in Shropshire on 30th August. The moon was out, half lit, waxing. Still an eclipse moon, I was thinking. Anyway, the sky was clear enough to go looking for some ‘faint fuzzies’ I wrote out a list of old favourites and new objects to look for. I started with the old favourite Double Cluster in Perseus, then found M34, by tracing a triangle shape from Algol and another bright-ish star Perseus K. My notes describe it as a loose and pretty cluster. I waited little longer for it to get darker, and tried to find M81 and M82, two spiral galaxies in Ursa Major. By imagining a ‘C’ shaped cluster of stars above the two easternmost stars in the plough shape, I had a very nice view of them both in my 20mm eyepiece. A few weeks prior, under an even darker moonless night, I’d seen these through 10X50 binoculars, thanks to Shropshire’s dark skies. M82 is the brightest, and it’s an edge-on spiral. Galaxy-minded, I stopped by a very bright M31 with M32, and found the Triangulum Galaxy (M33) in my binoculars, although it evaded my telescope, and I’ll admit that usng the equatorial mount like I used to use the dobsonian, was becoming a bit of a trudge. I’ve either got to use the equatorial mount properly, or go back to the dob. The moon somewhat spoiled observations in the south-west, but I took in a vie of M13 in Hercules that showed a bright ball, with no discernable stars in my 8″ mirror. Once again, I wished I had the 10″ mirror of my Dob. I looked for M103, in Cassiopeia, and found a loose grouping of stars, and I noted I wasn’t convinced I’d found it. But my lovely Cambridge Press Messier book (probably in my top 5 favourite astronomy books), describes it as a very loose, somewhat disappointing cluster that looks like a chance grouping of stars. So yes, I’m confident enough to add the object to my list. Disappearing behind the trees was M11, which I found as a binocular object. A very bright cluster. The mist came down at 23.30, and dew was all over the scope. I saw an interesting object over to the east, and the binoculars showed me the Pleiades (M45) rising! I was pleased to see them for the first time this season. I had a lovely view through the scope’s 20mmm eyepiece. Later, I was able to watch other winter constellations rise, from the comfort of my caravan bed, (I’ve always got windowlene in the van to clean the glass windows). Through the night I watched Taurus rise, the Hyades, Gemini, and Orion, the wonderful winter constellations that will, in a few months, be high and glorious in the inky black winter skies. I realise I haven’t written up my eclipse notes on here, and I will soon. It’s just that I need time to do it right, such was the utter splendidity of the whole trip. But I’ll put a picture up here of a little eclipse trip post-script that was a great little extra experience. The Northern Lights! Well, I say Northern Lights, but all I really saw was a light haze in the sky on the horizon as we flew back from the States on the night of Tues 22nd August. The penny didn’t drop that it was the Aurora, till I realised that Ursa Major was right overhead and Polaris marked the brightest spot. Other astronomers on the same trip, on a different plane (heading for Manchester and not Heathrow), saw curtains of light, which I didn’t see. I can only assume their extra few degrees Latitude enabled them to get a better view. Most people were asleep on my flight, but I did get a few other astronomers to sit in my window seat and confirm the sighting. Luckily I had my SLR with me, and took a 20 second exposure, which shows the plane’s wing, and reveals the colours. My first aurora photograph! I was most pleased! We had a nice gathering in Shropshire for the Perseid Meteor Shower. A few astronomers, campers and friends all lined their chairs up and got snug with blankets, wine or whatever, on the Saturday night, and between 22.15 and 00.10 we logged 102 meteorites. Not all of them were Perseids, I estimated about twenty were the usual sky-blazers you’d see anyway on a night observing for a couple of hours. Three in particular were fantastic fireballs, leaving smoky trails. One had a green hue. Quite spectacular! In the day, my astronomy friend Graham was setting up, and getting acquainted with some seriously technical imaging equipment, with a view to solar imaging (pictured above). The next day, Graham and I sat for another hour hoping to see more meteorites, but there was slight cloud cover, we saw only six. I tried to capture one on film, but after an hour of constant 20 second exposures, the battery died. But it was another pleasant night out in the sticks.